Lacrosse Keychain -Perfect Lacrosse Gift!!! WHO LOVES LACROSSE?! Spread and Express your Pride for Lacrosse with this keychain. Tired of boring lacrosse keychains? Want something fashionable and comfortable to help you keep track of your keys? 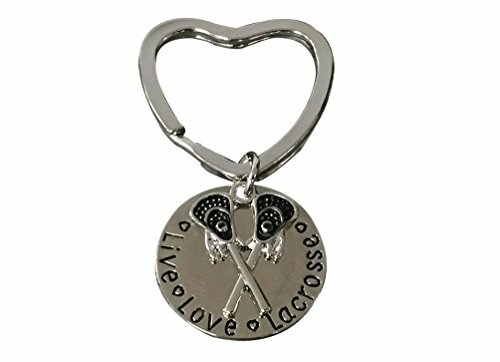 Our live love lacrosse keychain is durable, and fashionable! DON'T LOSE YOUR KEYS- Want something fashionable and comfortable to help you keep track of your keys? If you do, this key chain is for you. Keep your keys safe and handy. It will make it easier for you to find your keys in your totes, purse, book bags/backpacks, diaper bag, gym and lacrosse bag etc. OUR MISSION. As a US company, we want athletes to be able to show team spirit with custom sports accessories for girls. We just love accessorizing traditional sports attire, and we think those accessories enhance the whole sporting experience. From bracelets to hair ties to keychains and more, we believe Sportybella jewelry instills pride and connection with a girl's activity of choice.